Allie McMurphy's first season as an entrepreneur on Mackinac Island is drawing to a close, but instead of being a quiet time to switch gears from fudge tours to renovations, she's being hounded (and possibly threatened) by those in town to join in and donate $2,000 to a bid for a film crew to shoot on her side of Main Street. Not that she doesn't want to be a part of a little healthy rivalry, but she has plans for that money for her own business. Filming begins and with it comes a body count. This isn't the typical "stumble across a dead body" situation for which she's becoming known. This time, the killer leaves a message for her at each scene. I really liked this one. Nancy Coco does an excellent job of messing with your head while you try to figure out who the baddie is. While you're being led around, trying to figure out what's going on, relationships grow and become tested. I have to say, she can make your heart race and you fall for a guy without being racy. WOW. Some intense moments between Allie and Rex and I am hoping to see something develop soon between those too. Her writing of the island really puts you in it. She wraps it all up cozily and throws in some delicious recipes for you to go along with. Thank you to NetGalley, Nancy Coco, and Kensington Books for allowing me the chance to read and review this story. I definitely recommend it. Another fun tale on the island! The series is nice and consistent, with steady development. I’m excited to see how the off season changes the dynamics between the characters. I received a copy of this book from the publisher in exchange for an honest review. I was not paid for this review. Sixth book in A Candy-Coated Mystery series! 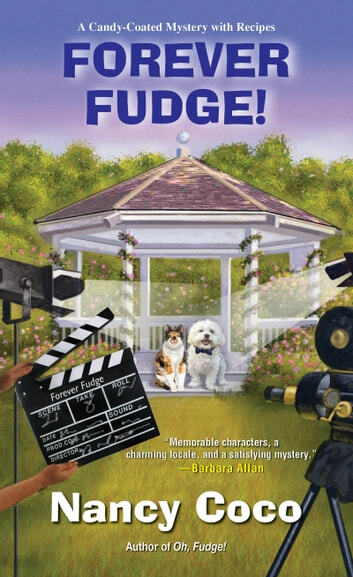 Forever Fudge by Nancy Coco is the sixth book in A Candy-Coated Mystery series. Allie McMurphy is the owner of the McMurphy Hotel and Fudge Shop on Mackinac Island. Labor Day is behind them and so is tourist season. It seems, though, that a film crew has invaded the island to film the pilot of a mystery show starring Dirk Benjamin. Dirk will be portraying a Rex Manning type character and will be shadowing him before production starts (lucky Rex). Allie is out walking Mal, her bichon poo, when he sniffs out a dead body in the alley. A note was left with the body with Allie’s name on it. Inside the note is written “kf3” which sounds like a chess move according to Mr. Beechum. The killer is challenging Allie to a battle of the wits. While Francis and her new hubby are on their honeymoon, Allie has extra responsibilities at the hotel. In addition, she is dealing with her breakup from Trent who is not ready to give up on their relationship and Rex who asks her out on a date. Out on another walk with Mal when he digs up a sock and a toe under a tree. The culprit left another chess clue carved into the tree. Who is behind the crimes and why are they singling out Allie? Join Allie are her most challenging and personal case yet in Forever Fudge. Forever Fudge contains well-developed and established characters as well as a beautiful location. I enjoy learning more about Mackinac Island with its historic locations including the Grand Hotel which was used as a location in my favorite film Somewhere in Time. I thought the pace was a little slower Forever Fudge as Allie deals with making fudge, the day-to-day running of the hotel, Jenn departing for Chicago, her romantic woes, a prankster and the whodunit. I missed Frances and her wit in this tale. Frances is off enjoying her honeymoon and does not return until the end. The main mystery may seem complicated on the surface, but I thought it was straightforward. I quickly pinpointed the culprit and then kept reading to see if I was correct. There is a limited suspect list, but there are good clues and a red herring. The secondary mysteries resolution comes out of left field and the motive was weak. The chess clues did not resonate with me since I do not play the game (I lack the patience for the game). I would have preferred Allie to actively investigate the crime instead of information being passed along to her. I could have done with less romance. Allie loves Trent, but he does not wish to live on Mackinac Island full time. I am rooting for Rex who seems to have more in common with Allie. However, his marital history stands in their way. My rating for Forever Fudge is 3 out of 5 stars. It is not my favorite book in A Candy-Coated Mystery series. There a luscious fudge recipes included in the book and a preview of Fudge Bites.